[Jakarta, LttW] Music in the urban areas today, (read: the so called “modern times”) are being tossed around in the midst of technological advancement, democratization, commercialization, “artists” population growth, and future challenges brought about by those myriad of situations that occur at this time. Indeed, on the one hand, dozens of “new” musical genre or style were emerged during these difficult times, which we could easily find and learn through various mass media, records stores, and among the chatter around us. Not only that, “collaboration” between fields such as music and technology, music and spirituality, music and visual, etc., are increasingly touted by many as the future way of looking at music. And with the widespread of both formal and non-formal music education institutions in urban areas throughout the world, it seems that those predictions may come to reality. This may seem encouraging, the fact that people around the world still persist to play, appreciate, and develop music. But on the other hand, many questions will arise. Is music still viewed and understood as a manifestation of the essence of human life itself? Is music still created from the self-reliance system of human life inherent in their own context? And is it able to function and act as a guardian towards the harmony within man and nature? We sure do hope so. Among those questions that seemed to not go to meet its midpoint, a small community on the island of Sado, Japan, seems to have found the answer since more than a decade ago. It is called “Kodo”, a new form of Japanese performing arts based upon their own philosophy of life, has successfully resonated and inspired the world. 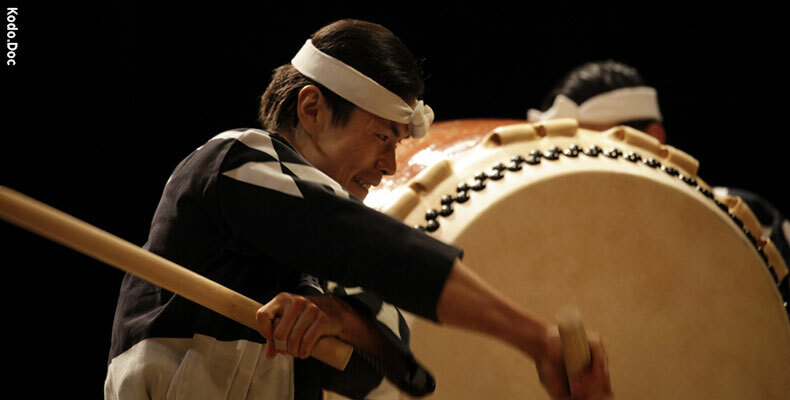 Exploring the limitless possibilities of the traditional Japanese drum, the taiko, Kodo is forging new directions for a vibrant living art-form. In Japanese the word “Kodo” conveys two meanings: Firstly, “heartbeat” the primal source of all rhythm. The sound of the great taiko is said to resemble a mother’s heartbeat as felt in the womb, and it is no myth that babies are often lulled asleep by its thunderous vibrations. Secondly, read in a different way, the word can mean “children of the drum,” a reflection of Kodo’s desire to play the drums simply, with the heart of a child. Since the group’s debut at the Berlin Festival in 1981, Kodo has given over 3400 performances on all five continents, spending about a third of the year overseas, a third touring in Japan and a third resting and preparing new material on Sado Island. Here is a video that tells how the life goes on the island of Sado. Surely it is an example that we ought to learn how an art-form can actually created and cultivated from the context that surrounds it. Please read the original Kodo Lifestyle: “Living, Learning, and Creating” now!